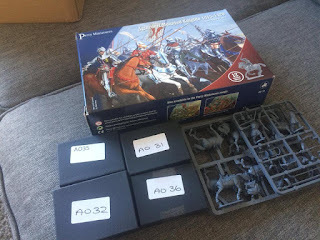 This week we get three French commanders to lead all the mounted men at arms, both already painted and in the pipeline. The French commanders are all from the same Perry Miniatures French mounted command at Agincourt set. Three dynamic characters who shall lead the French men at arms in glory against the English usurpers. The first noble is Waleran de Raineval, Comte de Fauquembergue who led the third French battle at Agincourt and was killed during the battle. On his jupon he is wearing his heraldry of 'arms or on a cross sable five escallops argent'. The Perry's have very handily sculpted this on the figure so it's more a case of colouring-in than free-hand. The second noble is Louis,Count of Vendôme who commanded the 1600 mounted men at arms on the left wing at Agincourt and was subsequently captured during the battle but survived the massacre of the prisoners. This figure took a dive on the floor while I was varnishing. His lance was bent double and I had to do a lot of touching up before the photos. Bugger! Again the Perry's have sculpted in his heraldic detail of 'arms quarterly 1&4 France Modern on a bent gules three lions rampant argent 2&3 argent a chief gules overall a lion rampant azure armed langued and crowned or' I had to repaint that a few times as I kept getting it wrong. I added the lance pennant from paper and did a pastiche of the arms in freehand. The final noble is Anthony Comte de Brabant who let 800 mounted men at arms on the right wing of the first battle at Agincourt and was captured in the battle and executed with many of the other prisoners at the pivotal stage in the fight. This chap is a lovely clean sculpt and is devoid of heraldry, which was quite a relief especially after painting Vendôme! A delivery from the UK this week shall see more mounted men at arms joining the French contingent shortly.